Conservative leadership candidate Maxime Bernier says he would give RCMP and border agents more resources to help address the flow of migrants crossing the U.S.-Canada border — and if that doesn't work, he'd consider temporary measures that include deploying the military to the border. Conservative leadership candidate Maxime Bernier says he would dedicate more resources to address the flow of migrants crossing the U.S.-Canada border illegally. And if that doesn't work, he'd consider temporary measures, including deploying the military to the border. "We're using the Canadian Forces when we have natural disasters in this country," Bernier said in an interview with CBC News. "Let's use them on a temporary basis in places where these people are crossing the border." Bernier first made the proposal in a statement earlier Monday after one of his rivals for the leadership, Kevin O'Leary, said in a campaign video and email blast that he'd use the Constitution's notwithstanding clause to prevent people from using a "loophole" in Canada's border agreement with the United States to "sneak across the border" and claim refugee status in Canada. Bernier said he'd also consider using the notwithstanding clause, as well as providing "whatever additional resources are required" for the RCMP and the Canada Border Services Agency (CBSA) to respond. "We need to use all the tools that we have to be sure that our border would be respected, and in the meantime, to fix the loophole in that agreement that we have with the U.S.," Bernier said. Quebec, Manitoba and British Columbia have been dealing with a surge in asylum seekers skirting legal border crossings to enter Canada from the U.S. since the election of U.S. President Donald Trump, who has promised a crackdown on illegal immigrants in the United States. Canada's Safe Third Country Agreement with the United States, which was negotiated as part of a border agreement in the wake of the Sept. 11 attacks in the U.S., requires asylum seekers to request refugee protection in the first safe country they arrive in, but only applies at legal border crossings and airports, where ineligible claimants can be denied entry to Canada. But migrants who are intercepted after crossing into Canada at other points are detained, identified and questioned then turned over to CBSA for processing. If they are ineligible for refugee status they could still be removed from Canada — but in the meantime, they have access to some social assistance. Public ​Safety Minister Ralph Goodale has said that the RCMP and CBSA are enforcing the law appropriately. O'Leary and Bernier's arguments Monday represent something of a new approach, arguing that even if the current law is being followed, Canada can change the law. The notwithstanding clause of the 1982 Constitution allows the federal and provincial governments to enact legislation that overrides some sections of the Charter of Rights and Freedoms, and has only been used a handful of times. O'Leary said in his email that use of the notwithstanding clause would allow the government to pass a law "making it clear that anyone crossing into Canada illegally from the U.S. would be ineligible to make a refugee claim." Some commentators noted the clause does not apply to international agreements on refugees, nor to the Safe Third County Agreement between Canada and the U.S.
O'Leary's campaign later confirmed his proposed use of the notwithstanding clause referred to overriding obligations to refugees established by the Supreme Court in a 1985 ruling called the Singh decision. That ruling recognized that asylum seekers are entitled, under the Charter of Rights and Freedoms, to a refugee-status hearing before facing potential removal from the country. This clause gives government the authority to respond to situations like this &amp; put in place reasonable policies for Canada. Bernier said some experts have different interpretations of the agreement with the U.S., though he did not provide examples. "Let's look at this agreement, and work with Canadians, work with the experts. But me, as a politician, I'm saying to Canadians: It's time to act and it's time to look at what we can do, and if we can send them back to their country, let's do it," Bernier told CBC News. 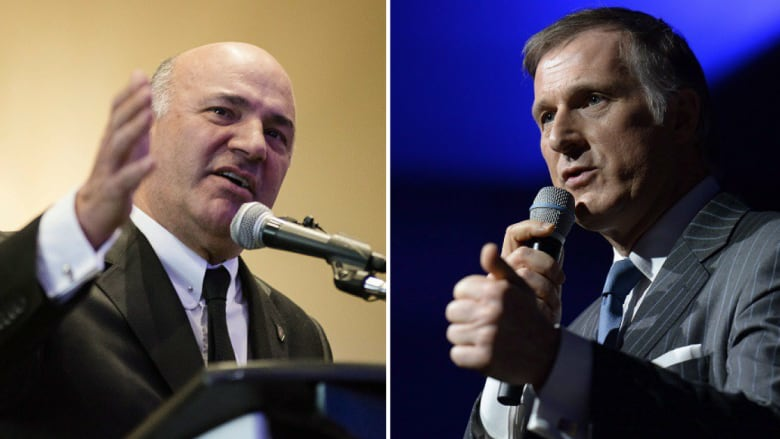 The statements from Bernier and O'Leary came ahead of a Tuesday deadline for signing up new members to be eligible to vote in the Conservative leadership contest. They followed comments made on the weekend by Steven Blaney, who sent out a strongly worded fundraising email denouncing alleged anti-Semitic remarks by some Muslim leaders. And Pierre Lemieux reinforced his opposition to legalizing marijuana amid news that the Trudeau Liberals would introduce legislation this spring to legalize pot by July 2018. The Conservatives choose a new permanent leader to replace interim leader Rona Ambrose on May 27.